Everyone has their own “Best chicken salad in the world” recipe. Try mine! You won’t be disappointed! NOTE: You can use a pre-cooked store-bought chicken if you’re in a hurry. While it will lack the tenderness of a poached chicken, it will certainly work if you’re in a hurry! Poach chicken with garlic, tarragon, green onions and just a pinch of salt. The best way I’ve found to poach chicken is: just cover the chicken with cool water in a large pot. Add the herbs (you can give the chicken any flavor you want; tarragon will enhance the flavor of this recipe, but you could also use rosemary, sage or whatever you like) and salt and bring to a rolling boil. Continue a rolling boil for 15 minutes on medium, to medium high heat. After 15 minutes, turn the heat off, remove the pot from the heat source and let the chicken steep for 1 hour, keeping it tightly covered. The chicken will be quite tender and will be cooked completely through. Chicken doesn’t have to be boiled to be completely cooked. Poaching keeps the chicken tender and moist. Remove the chicken from the pot. When cool enough to handle, remove the skin, de-bone and refrigerate. When cool, cut into chunks of desired size for salad and refrigerate for at least 4 hours. Meanwhile, mix the dressing ingredients. After mixing, allow to set for about 1 hour to blend the flavors. Taste and adjust to suit your taste. Wash and halve seedless green or flame grapes. 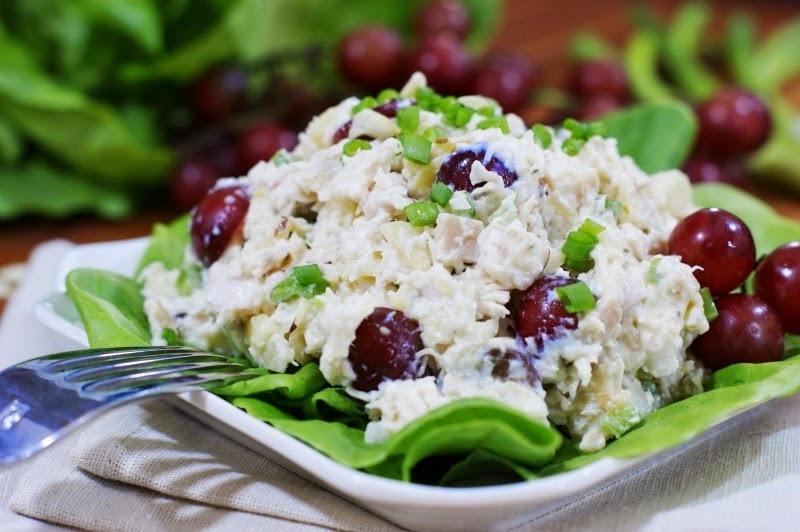 Blend together cubed or chunked chicken, pecans, grapes (be generous with the grapes), green onions and dressing and !voila! you’ve got the best darned chicken salad you’ve ever made! To serve, garnish with fresh sprigs of tarragon or other pretty herbs and orange slices and serve on a bed of leafy and colorful lettuces, Belgian endive leaves, avocado halves or whole grain bread.